Background and Objectives: In July 1, 2011, the Accreditation Council for Graduate Medical Education (ACGME) implemented new duty-hour and supervision requirements for all accredited residency programs. These new requirements limited post-graduate year 1 residents (PGY-1s) to 16-hour duty periods and required them to have onsite supervision. We conducted a national survey of family medicine residents to assess the impact of the new requirements. Methods: Using an online survey we assessed residents’ opinions regarding the effect of the new duty-hour requirements on patient safety, quality of care, and resident mental and physical well-being. We contacted 439 programs by email and 156 programs agreed to participate. Results: Of an estimated 3744 potential participants, 544 respondents completed the survey. Ninety-seven percent of the respondents thought that their program had implemented the new rules successfully, and 63% reported working 51-70 hours per week. Nineteen percent admitted underreporting duty hours. Fifty percent agreed that the new rules had improved resident mental and physical well-being, and forty-nine percent agreed that patient safety and quality of care improved. However, 30% disagreed that resident education and training were better. Sixty percent reported decreased clinical experience; 42% felt decreased confidence in their ability to work independently after residency. Forty-nine percent were concerned about the increase in handoffs. Conclusions: The respondents had mixed opinions about the benefits of the new duty-hour requirements in their training program. Our study found a significant gap between the intended benefits of the new dutyhour and supervision requirements and the residents’ perception of the benefits. The new Accreditation Council for Graduate Medical Education (ACGME) duty-hour requirements  went into effect on July 1, 2011. Although all ACGME accredited residency programs in the U.S. are required to comply with the new requirements, residency program directors struggled to implement the new rules. In particular, they expressed difficulty and uncertainty about their ability of meeting the restriction of PGY-1 resident work-hour to 16 hours per shift and the new requirement of direct onsite supervision of PGY-1s. These new requirements were untested. Previous surveys [2,3], including our national survey of family medicine residents in 2010 , raised concern about the potential impact on patient safety and on residents’ education, as well as their mental and physical health. Furthermore, many programs worried about the cost of implementing the new standards. A recent study on the cost implications of the ACGME’s 2011 changes concluded that the cost of implementation could significantly increase among teaching hospitals unless patient adverse events declined substantially . For these reasons, we conducted a national survey to assess family medicine residents’ perception of the impact of the duty-hour changes. This follow-up survey was conducted in June, 2012, approximately one year after the implementation of the new requirements. In our previous study  we described the rationale for limiting our survey to family medicine residents. From June 1, 2012 to June 30, 2012, we conducted a cross-sectional survey approved by the Institutional Review Board at Mercy/Methodist Hospital and San Joaquin General Hospital. We contacted 439 program directors/coordinators of family medicine residency programs by email, inviting their residents to participate in an anonymous web-based survey using SurveyMonkey. com. Each program director/coordinator was asked to inform us of their intent to accept the invitation and forward the survey link to their residents. Resident participation was entirely voluntary and no incentives were offered to participants . Subsequent reminder emails were sent two and three weeks after the initial invitation, and the survey was closed on June 30, 2012. We developed a 20-question survey based on the new ACGME duty-hour requirements and pilot tested it for clarity and relevance with 42 family medicine residents from San Joaquin General Hospital and Methodist Hospital of Sacramento [3,7]. The questions were refined after receiving input from the pilot test participants. The final survey was then uploaded into SurveyMonkey.com. Collected data were downloaded into a secured server. SPSS Version 11.5 (IBM Business Analytics) was used for all analyses. The tests were used to compare scale responses. A chi-square test was used for nominal data association . Four hundred and thirty-nine family medicine programs were invited to the study. One hundred and fifty-six programs (36%) accepted the invitation with an estimated 3744 potential resident participants. Of these, 544 respondents (15%) completed the online survey and provided data for analysis. The demographic features of the respondents are summarized in Table 1. Table 1. Demographics of respondents (N=536*). Ninety-seven percent of the respondents perceived that their program had implemented the new rules successfully. Ninety-nine percent of the respondents perceived that their program has limited resident duty hours to 80 hours per week. Sixty-three percent of the respondents reported working 51-70 hours per week in a 4-week period. Only 1% reported working more than 80 hours per week. 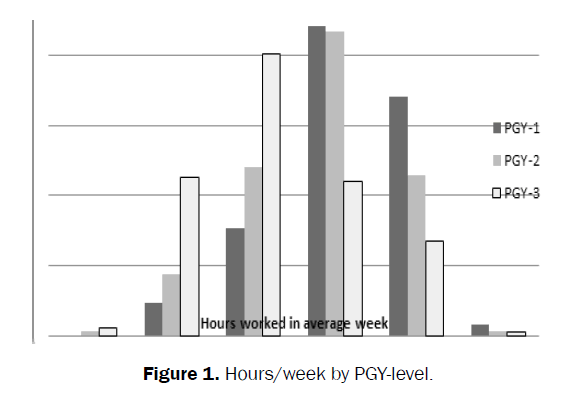 Subgroup analysis found that fewer PGY-3 residents reported working 61-80 hours per week than PGY-1 and PGY-2 residents (P<0.001) (Figure 1). Figure 1: Hours/week by PGY-level. Nineteen percent of the respondents admitted underreporting their work hour for various reasons. The most frequent reasons given were: “To avoid getting the residency into trouble” (67/103, 65%), and “To be able to provide continuity of care for severely ill or unstable patients” (64/103, 62%). Other reasons included: “To avoid getting themselves into trouble with the residency" (46/103, 45%), "To be able to participate in an event of exceptional educational value" (40/103, 39%), and "To attend the humanistic needs of a patient or family" (47/103, 46%). There were no significant differences in the gender proportions of those who admitted underreporting. However, 60% of females compared to only 29% of males selected the reason “to attend the humanistic needs of a patient or family,” (P=0.002). Respondents overwhelmingly perceived that their programs had implemented the new supervision rules: direct supervision, 82%; indirect supervision with supervising physician onsite and available, 85%; indirect supervision with supervising physician offsite and available by phone, 89%; and oversight with feedback after care was provided, 76%. 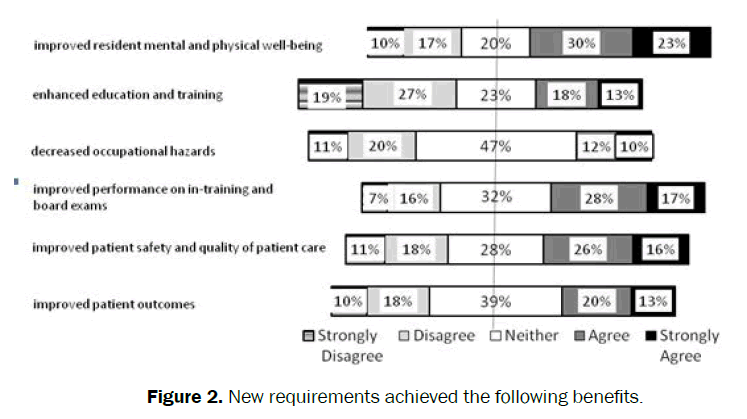 Fifty percent of the respondents agreed that the new rules had improved resident mental and physical well-being, and 49% agreed that patient safety and care quality improved with the new supervision rules. The perception of benefit of enhancing resident education and training was mixed: 40% strongly agreed or agreed versus 30% strongly disagreed or disagreed. A large majority (97%) of the respondents agreed that their program had complied with all the components of the current duty-hour requirements. Sixty percent of the respondents agreed that the new rules had improved resident mental and physical well-being. However, 53% disagreed that their education and training were better under the new rules. Their responses to improved patient safety and care quality were split: 40% agreed and 34% disagreed. Subgroup analysis found that PGY-1 residents’ responses were more favorable than the responses of PGY-2s and PGY-3s (P<0.001). Seventy percent of the respondents agreed that their mental and physical well-being had improved. However, only 36% agreed that their education and training were better under this provision, and 41% were neutral. Only 49% agreed that patient safety and care quality were better. Residents’ agreement with the achievement of intended benefits was as follows: “improved resident mental and physical well-being” (53%),“decreased occupational hazards” (45%), “improved patient safety and quality of patient care” (42%), “improved patient outcomes” (33%), “enhanced education and training” (31%), and “improved in-training exam and board scores” (22%). Subgroup analysis found that PGY-2 and PGY-3 residents viewed the intended benefits less favorably than PGY-1 residents (P<0.001) (Figure 2). Figure 2: New requirements achieved the following benefits. Sixty-five percent of the respondents believed that the new rules had decreased their clinic experiences and ability to gain new skills. Other negative consequences included: decreased confidence in working independently after residency, 42%; not being confident that they could adjust to the expected longer work-hour after residency, 49%; continuity-patient clinics being negatively impacted, 32%, and concern with decreased patient safety because of increased number of handoffs, 49%. Subgroup analysis found that agreement of perceived negative impacts was strongest among the PGY-3 residents (Figure 3). Figure 3: New requirements unintentionally caused the following negative effects. Sixty-seven percent of the respondents said that they did not need schedule adjustment to meet the continuity-patient visit requirements, while 23% had additional clinic sessions and 10% saw an increased number of patients in each session. Generally, resident opinions were quite mixed, but PGY-1 residents were more in agreement than PGY-2 and PGY-3 residents, that the new requirements were beneficial to the residency, (P<0.001) (Figure 4). Figure 4: Overall, duty-hour requirements have been good for residency education. The ACGME enacted the 80-hour per week duty-hour rules for residency programs in 2003. In 2011, under the pressure of national organizations such as the Institute of Medicine (IOM) and the Occupational Safety and Health Administration (OSHA), the ACGME decided to implement additional restriction on work hours and increased direct supervision of residents, aiming to improve patient safety and quality of patient care. We conducted a follow-up national survey of family medicine residents to assess the impact of the new ACGME duty-hour requirements eleven months after they went into effect. Overall, the respondents supported many provisions of the new duty-hour requirements and strongly agreed that their programs had successfully implemented the new changes. While a majority of them worked less than 80 hours per week, 19% of the respondents admitted underreporting their duty hours. More PGY-1 residents compared to senior residents underreported duty hours. In our survey, PGY-1 residents also reported working more hours than senior residents; this is in contrast to what was implied in the results of a recent national follow-up study . Many residents underreported their work hours to avoid the consequences of noncompliance and because of personal altruism. Interestingly, a higher percentage of female respondents gave the reason of attending the humanistic need of patients or families. This may suggest that female and male residents may have different perception of how to balance patient care and personal needs. Regardless, program directors need to take underreporting of duty hours seriously and to implement effective monitoring and counseling systems that discourage such practice. The new ACGME duty-hour requirements intended to improve patient safety by promoting resident physical and mental health. The ACGME assumed that less fatigued residents would learn better and provide safer and better care to patients. However, before its implementation, several national surveys had raised concerns that the new duty-hour requirements would not be able to achieve their intended goals. A national survey of 6202 residents (family medicine, 15%) from more than 14 specialties, found that approximately six months after implementation of the new requirements, 42.8% residents reported no change in the quality of their education and another 40.9% reported that their education had worsened . Furthermore, 72% reported increased handoffs and 65% perceived that senior residents were taking on the work of more junior residents because PGY-1 duty hours were changed to 16 hours per shift. However, in the same survey, 62% of the respondents believed that the quality of life for interns was better. The results of our survey of family medicine residents lend further support to the previous conclusion that the new duty-hour requirements have not produced any significant improvement in resident education or patient safety. In our study, a significant portion of the respondents (53%), especially senior residents, did not perceive that limiting work hours per shift had benefited their education or patient safety. However, most of the respondents (60%), notably PGY-1 residents, agreed that the new rules had improved their physical and mental well-being. Similarly, only 50% of the respondents agreed that increased supervision of interns had improved their mental and physical health, but 60% and 52% said it did not improve their education and patient safety respectively. Lastly, only 36% agreed that limiting night float to no more than six consecutive nights had improved their education and training. Limiting PGY-1 resident duty hours to 16 hours per shift and the use of night-float rotation have effectively changed resident work schedule from the traditional on-call model to a shift-work model. Residents now work more shifts, but less hours per shift, rendering 24-hour calls obsolete in many programs. The shift-work model is neither new nor unique to the healthcare industry. Emergency room physicians and nurses have worked under this model for many years. Admittedly, some family medicine residency graduates choose shift-work based careers as hospitalists or as urgent/emergency care physicians; however, a majority of family physicians still join practices that are based on the traditional on-call model. While there are personal and family benefits that steer some toward the shift-work model, there are also known potential negative consequences such as sleep deprivation secondary to disturbance of the normal wake-sleep diurnal cycle and uncertain long-term physical and mental changes. A recent study of the effects of a night-team system on pediatric resident sleep and work hours supported previous findings that limiting duty hours per shift was unexpectedly associated with decreased sleep hours. Our previous survey also found that many residents used off-duty hours for other activities instead of sleep. Therefore, implementing further duty-hour restriction to mitigate resident fatigue may have a limited role in improving patient safety, quality of patient care and resident education. Our study also found that the new duty-hour requirements have produced several unintended problems that support our concern that, under the new duty-hour provisions, some residents may feel unprepared to transition into future practice setting that does not limit work hours. Fifty percent of the respondents felt that the new duty-hour rules had decreased their confidence and ability to meet the demands of an attending physician schedule after residency. Our survey did not explore the possible reasons for this response, and future studies should consider addressing this important issue. In addition, it is disconcerting that forty-nine percent of the respondents perceived that patient safety and quality of patient care decreased because of an increased number of handoffs, while thirty-five percent felt that patient care was compromised because of an increased workload in a shorter shift period. These unintended problems found in our study raise the concern that these new duty-hour regulations may have contributed to a suboptimal environment for preparing residents to become confident and independent physicians in the community. Finally, we conclude that our respondents had mixed opinions about the overall benefits and results of the new dutyhour regulations in their programs. Our findings are limited to family medicine residents and should be applied to other specialties with caution. Two-thirds of the respondents had experienced the old duty-hour requirements and this may bias their opinions about the new standards. This survey took place eleven months after the new duty hour regulations went into effect. It is conceivable that given more time, the new regulations may still achieve their intended effects. In addition, our data may be confounded by recall and sampling bias, but we believe our findings are valid and they are consistent with a recent large national survey. The new ACGME duty-hour requirements were launched in July, 2011 with the hope that further restricting duty hours and increasing supervision of residents would improve patient safety and quality of patient care, as well as resident education and well-being. Our current study found a significant gap between its intended benefits and residents’ perceived benefits. We do not suggest that the current duty-hour requirements are entirely unhelpful, and certainly, we do not imply that residents would like to return to the old system of unlimited work hours. We believe that duty-hour regulations are important for resident training and are here to stay. Nevertheless, we recommend that the ACGME consider adopting a more flexible approach, because the needs and goals of trainees and different training programs are clearly not the same. Additional research and modification of current duty-hour requirements will likely be needed if the ACGME’s goals are to be achieved. We propose that further resident surveys will be helpful and should be done three years after implementing the new duty-hour regulations so that their full impact can be assessed. Drolet BC, et al. Residents perspectives on ACGME regulation of supervision and duty hours- A national survey. N Engl J Med. 2010;363:34. Antiel RM, et al. ACGME duty-hour recommendations - a national survey of residency program directors. N Engl J Med. 2010;363:12. Lo V and Ward C. ACGME duty hour week proposal--a national survey of family medicine residents. Fam Med. 2011;43:318-324. Nuckols TK and Escarce JJ. Cost implications of ACGME's 2011 changes to resident duty hours and the training environment. J Gen Intern Med. 2012;27:241-249. Philibert I, et al. Education AWGoRDHACfGM. New requirements for resident duty hours. JAMA. 2002;288:1112-1114. Ulmer C, et al. Resident duty hours : enhancing sleep, supervision, and safety. National Academies Press, Washington, D.C; 2009. Drolet BC, et al. Residents' response to duty-hour regulations--a follow-up national survey. N Engl J Med. 2012;366:35. Chua KP, et al. Effects of a night-team system on resident sleep and work hours. Pediatrics. 2011;128:1142-1147.